Fifty years ago, July 1967 marked the end of steam on BR’s Southern Region. Keith Farr recalls some of the outstanding performances on the former LSW main line out of London Waterloo. 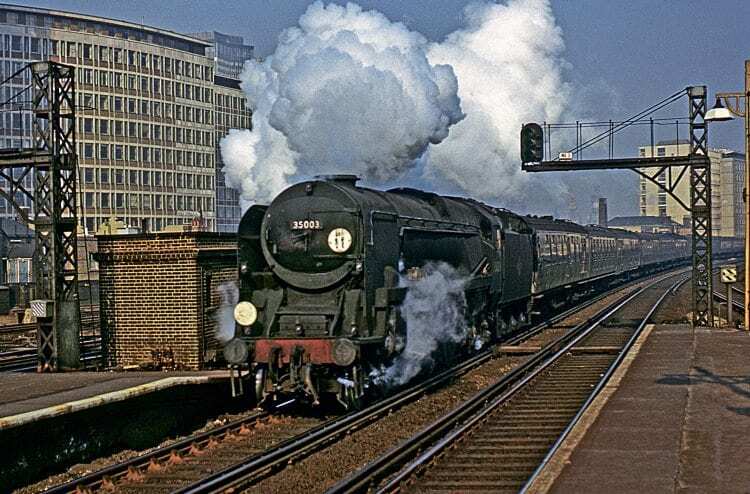 WATERLOO station in the 1950s was different from other London termini. Substantially rebuilt by 1921, it was more spacious and, thanks to third-rail electrification, cleaner and more tranquil. But there was still some steam: as you emerged from the Underground, soft music from the loudspeakers would blend with the singing of Drummond safety valves from ‘M7s’ at the buffer stops, while the refined tones of the station announcer would create visions of Budleigh Salterton, Ilfracombe and far-flung Padstow. Inevitably, Bulleid Pacifics monopolise most accounts of the last days of Southern steam. But in the 1950s they were not the only actors in the Southern theatre: ‘Lord Nelsons’ and ‘King Arthurs’ backed them up; and, on summer Saturdays, holiday ‘extras’ had to make do with ‘S15’ and ‘H15’ 4-6-0s, while Drummond ‘D15’ 4-4-0s would be entrusted with Lymington boat trains. Strangers occasionally entered the Southern camp, and not just in the 1948 Locomotive Exchanges when ‘A4s’, a ‘Duchess’ and a rebuilt ‘Royal Scot’ ‘strutted their stuff’ between Waterloo and Exeter. On April 24, 1953, the driving axle of ‘Merchant Navy’ Pacific No. 35020 Bibby Line fractured at Crewkerne, and all 30 ‘MNs’ were withdrawn for inspection and, if necessary, repair; during their absence, ‘Britannias’ from the Western Region were drafted to the Southern’s Exeter road and ‘V2s’ from the Eastern worked to Bournemouth, while ‘B1’ and Class 5 4-6-0s, both LMS and BR, deputised for ‘West Country’ Pacifics covering ’Merchant Navy’ duties. How did the ‘foreigners’ perform? Logs are scarce but F H Worsfold recorded an acceptable ‘V2’ performance on the Down ‘Bournemouth Belle’ which appeared in The Railway Magazine for August, 1953, and is reproduced in Table 1. With 12 Pullmans grossing 510 tons, No. 60893 passed Woking on time in just under half-an-hour from Waterloo. The minimum speed on the climb to milepost 31, averaging about 1-in-300, is shown as 53mph, although the point-to-point times suggest something slightly lower. Progress was then interrupted by a permanent way slack (PW) at Fleet from which the recovery was mediocre, although, with no troughs on the Southern, the crew may have been trying to conserve water.